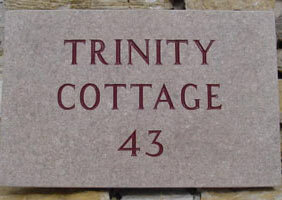 We have found that many of our customers now prefer to have their stone house sign or memorial made with stone quarried in the UK, rather than one which has been imported from China or India. 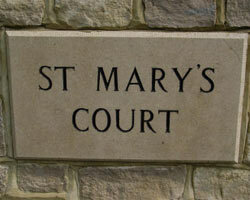 Purbeck stone is a very durable and hard wearing stone quarried in Dorset. It has long been used in churches and cathedrals. It was formed in the Jurassic/ Cretaceous era. 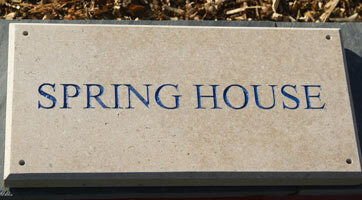 Each bed of Purbeck stone varies in colour and has its own range of fossils within it. The stone is cut for us to a thickness of 30mm. Other sizes can be quoted for. The surface is honed to smooth finish. The edges can be square or chamfered. 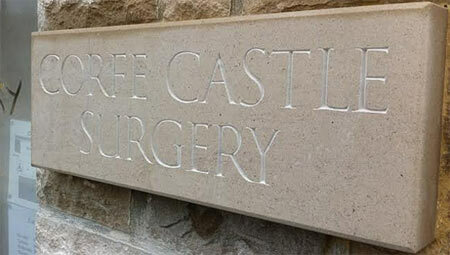 The lettering can be carved into the sign using any of our fonts. 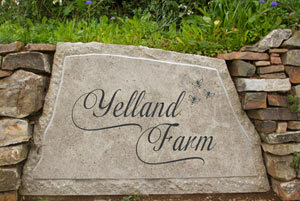 The letters are then painted to a colour of your choice or left unpainted. As standard we use black, white, ivory, gold and silver, but we also have a number of other colours. 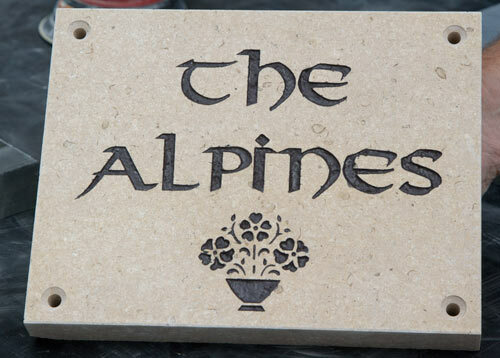 Brown and dark green actually look lovely on the cream stone. Click here for other paint colours. The prices above include 6 letters. Extra letters are £1.10 each for the next 19 letters and 55p per letter thereafter. The sizes shown above are the standard sizes that are cut for us in the quarry. 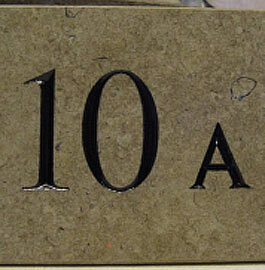 We can cut down the stone for smaller sizes or order in special sizes. Holes can be drilled @ £1.10 per standard hole or £1.95 per countersunk hole. We also sell a very strong adhesive called Grab and Bond. Although Grab and Bond is meant to hold a sign we would also be inclined to add an extra support rail or use use some hidden fixings which are available @ £3.75 each. 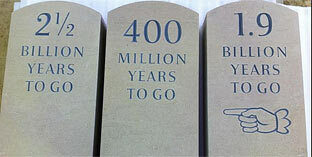 These are shown on a granite sign in the photo to the right. 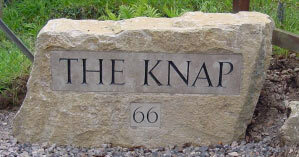 As well as our standard signage we can quote for some more unusual purbeck stone signs and memorials. Just let us know what you are looking for. 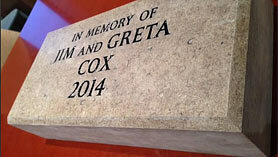 We can have can use rough edged stone, shaped stone and thicker stone signs and memorials. NB These do take at least 6 weeks for the quarry to cut. Made in the UK. 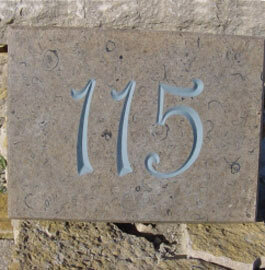 Our team at The Sign Maker looks forward to helping you with your Purbeck Stone sign.